Sometimes the reggae industry, with it's tendency to saturate the market with re-runs in a shiny new package, becomes stagnant. There seems to be no originality, no innovation. Every once and awhile an artist comes along that captivates a listener and offers refreshment. Nico D, hailing from Oslo, Norway, is like a cool, crisp drink on a hot caribbean day. Born Nicolas Albert Holter, Nico D has had more of an international upbringing than most. He was born in Paris and moved frequently from country to country with his family before settling down in Oslo. While in High School he met Deejay Daniel Lion and Admiral P from Zambia and their joint passion for reggae music inspired them to start the sound system Jah Ark Manifest. With Lion behind the turntables and Admiral P and Nico on the mic, Jah Ark Manifest would soon stand out as Norway's #1 sound system. They have kept it going for over 10 years now and are still going strong. Nico released his debut single 'Ruff Times' featuring Jah Mason in 2009 and hit a landmark when it went to #1 on the Jamaican hitlist. The song was on the list for 25 weeks! His debut album 'Coming in From the Cold' has now arrived. Surprising is an appropriate description because Nico D, even with the regional success of Ruff Times, has flown way under the radar. At least under this radar. From top to bottom, 'Coming in From the Cold' is, well...brilliant! Production is handled by a wide variety of top drawer craftsmen, including Calibud (Jamaica), Bost and Bim (France), and PowPow (Germany). Setting the pace is Rise and Shine, a well-produced, solid tune with a positive message for the youths of today. Nico D's voice is as smooth as honey, whether he is singing or chatting. Soul Searching is innovative as well as appealing. The music has an r and b/hip-hop quality about it, with a unique, yet total reggae delivery. Say It Ain't So featuring Admiral P is a gem. The riddim and delivery is a throwback to early reggae/ska tunes. The back and forth of Nico's singing and Admiral P's deejaying is precise and bubbling. Star is a boomshot...boom tune..whatever you'd like to call it! Nico's silky, simple delivery rides a simple one-drop riddim. Proof positive that less is indeed MORE! He croons: "I just want to tell you.....baby, you're a star. Remember that you are...always. I just want to show you.....how meaningful you are and without you in my life there's a scar...baby." Perfectly simple! Singjay veteran Lutan Fyah and Admiral P join Nico on No Badmind. The three compliment each other nicely, with Admiral P again adding a solid flow. One Day features Nico D riding the glassy wave of 2009's 'Surfer' riddim from the PowPow production team. It's an assurance, of sorts, as a spanish-style guitar riff reminiscent of 2008's 'Samba' riddim from DownTown Sound underpins the optimism in the lyrics. "Things will be better one day. Things will have to change and I won't feel this pain." With a smooth chorus and rapid-fire verses, Nico D shows dexterity in his delivery, an ability that resonates throughout the record. The aforementioned Ruff Times featuring Jah Mason adds a hard-hitting vibe musically and lyrically. The bass is heavy and suits Jah Mason's raspy, fire-bun- dem flow. Kingston Girl injects an effervescence to the record. The riddim is slow and steady, with a lovely sax riff throughout by none other than the legendary Dean 'Canon' Fraser. The harmonies are tight by Nico D and the ladies in support. Again, the flow and delivery is superb! Another gem. Trouble in Paradise, featuring Admiral P and Iyah Kee, adds yet another dimension to the album with an upbeat, modern riddim with deliveries to match. One of These Days, featuring Vybrant, is an excellently crafted tune in both riddim and melody. Nico D and Vybrant's sparring is done with skill and confidence. True to the lyrics, they do "captivate the people dem with the chorus" with a positive outlook and message about the future. The laid back Grow closes the set nicely, as Nico D states his decision to "go with the flow" has resulted in his being able to grow. Another positive reminder to rise above the negativity and look for the good in yourself and others. In short, 'Coming in From the Cold' is quality through and through! 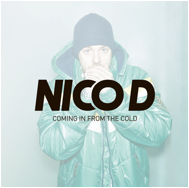 Nico D has managed to produce a classic debut album. Hopefully the reggae world will latch on because this record deserves to be mentioned with any and all of the best reggae albums of the last few years.12 tracks of pure niceness!